There is a famous quote that goes, “No plan survives contact with the enemy” (If you’re a nerd like me and like this sort of thing, you can read about the history of this quote here). I think of these words a lot. Oftentimes I remind myself that in my case, “No plan survives contact with reality.” It could be that I’m not a great planner (very true) or that I just exist in a position with a lot of variables that I can, must, and do work around (also true). In any case, it could not have been more true this week. As I wrote my last post on Tuesday, I was raring to go with a million things on my to-do list before we started school today, Thursday. My blog posted, I let my son know we would be going to a local outdoor pool the kids love in the afternoon as a treat and I hopped right to the task I had to finish before leaving — getting the lawn mowed. As I finished mowing & mentally checked that item off the list — yes! — I came in and within moments my son became violently ill.
I’ve been a mom long enough that when it comes to this type of illness I pretty much have a constitution of iron. I can be there with a washcloth & toothbrush, clean up, and will myself to stay healthy so I can act as nurse. I, however, have not been a mom long enough to lose hope each and every time that it’s a one-off fluke. Sadly, it was not. And thus, we embarked on 48hours of everyone in the family being sick to one degree or another. Obviously the pool was out until further notice and the to-do list went out the window. We stayed home (of course) and the kids basically slept and barely moved for two days (by contrast our son generally bikes around 20miles per day). I did extra laundry, played nurse to my ‘babies’, and made quick runs out to the store for saltines and Gatorade. I managed to steal a few moments to get outside weed & tidy up my landscaping and spread out the two batches of grass clippings the neighbors had deposited in the compost area since we’d been on vacation. Kate Atherley‘s Diamonds In Your Shoes is the exclusive club pattern for the month and it’s cruising along already. 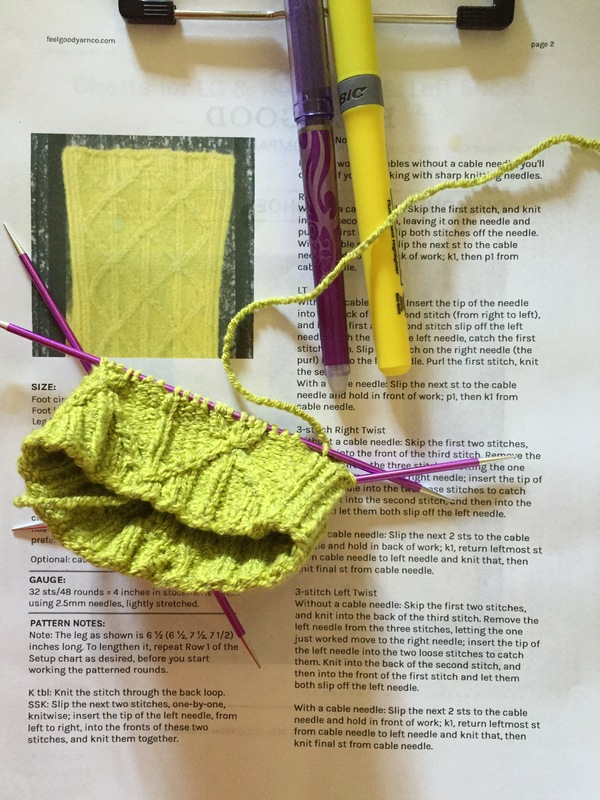 I’m loving her instructions for cabling without a cable needle — so handy during the summer when I’m on the go. If I don’t need to carry along a cable needle, that’s one less thing I can lose in transit. 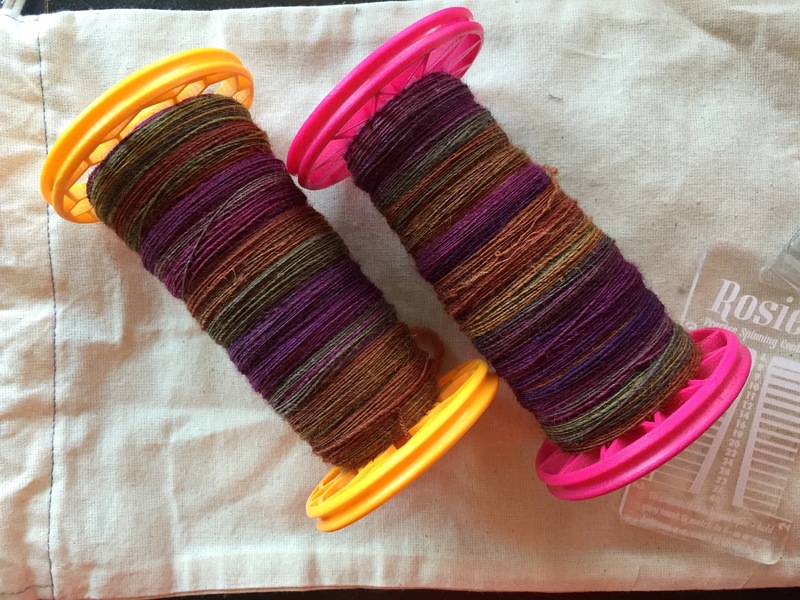 Eventually this will be a 3-ply — I’m very interested to see it as the spindle spun singles I spun from some roalgs I rolled and will most likely be pretty unique when compared to the wheel spun singles. In the mean time, though, I thought I’d start a little bonus heavier weight 2-ply. This colorway is also from Three Waters Farm and is called Painter’s Backdrop dyed on Merino/Superwash Merino/Tussah Silk top, 40/40/20. It’s one of the braids I took with me on vacation, but didn’t get to. 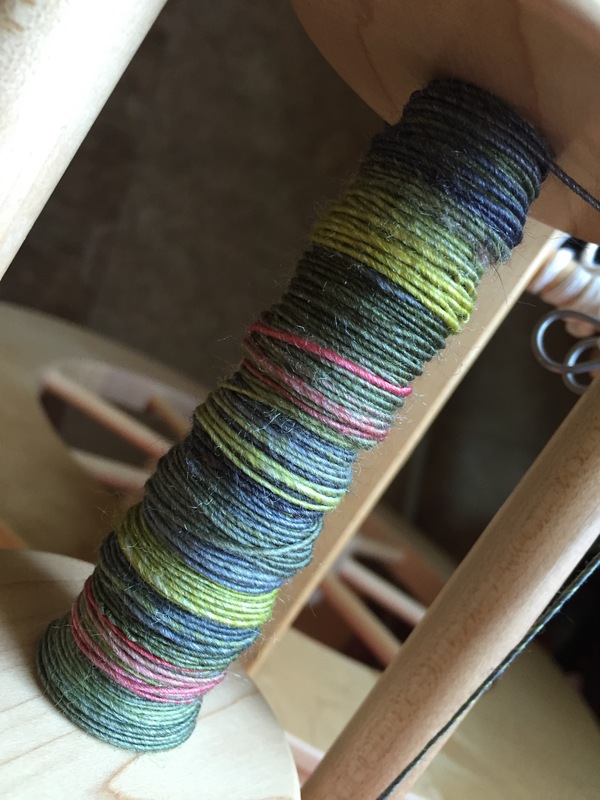 This braid has been in my stash since last November so I thought it was time to spin it up. 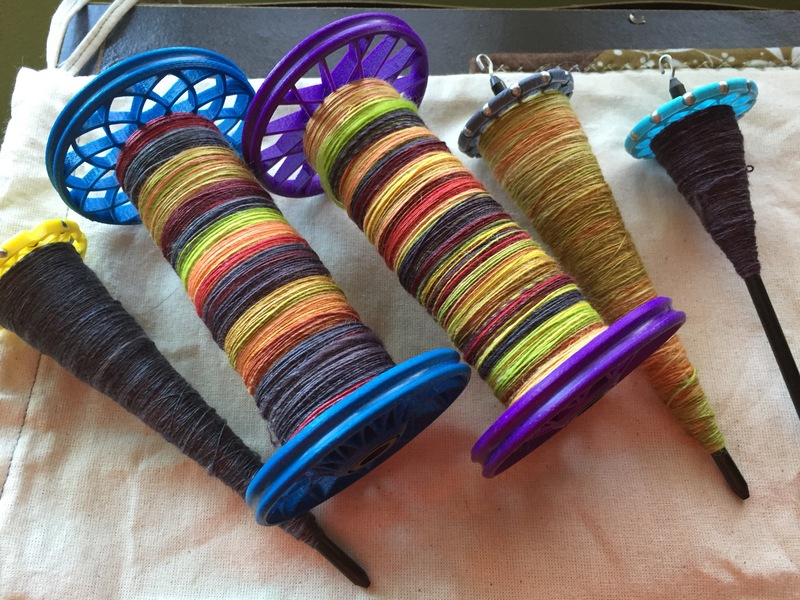 This is Dyeabolical‘s 66 Sunset colorway dyed on Fawn Shetland. I really love the depth of color on the Fawn Shetland. After all the less than appealing excitement of this week, I barely even remember what was on my to-do list when I was last typing away here. It feels like a distant memory. My plans definitely did not survive contact with reality. In any way. At all. And yet, the world keeps spinning ’round and ’round and the sun has risen and set each day. As everyone appears to be on the mend now, I’m here thinking about our plans for the weekend and next week. Wisconsin Sheep & Wool is not too far off either. And then there will be a trip up to my parents’ next month. And our next vacation out there on the horizon. Oh, the plans I will make that will not survive reality to fruition and the life I will lead and the things I will get done in spite of it all! Glad you all seem to be feeling better now. It’s SO miserable when the whole family gets sick. You’re so welcome! I love my Passion Planner. I’ll admit I accidentally bought a big (8.5×11) this year and it’s a little too big for me, BUT after I read your comment here I ordered a new compact one (vintage brown!) for 2017. Thank YOU for the reminder!!! Me either! It should be really fun! Glad everyone is on the mend. I was hoping the rest of you would be spared, after your IG post about your son. Your spinning is so beautiful! Yikes, I hope everyone is feeling better and your plans are getting back on track!